Chelsea Ladies had an early taste of the Wembley experience yesterday (Wednesday) when the players and staff took the opportunity to familiarise themselves with the surroundings of the national stadium. The girls are preparing to face Notts County on Saturday in the first FA Women’s Cup final to be held at Wembley. Emma Hayes and her side toured the pitch and spent some time in the home dressing room, having been drawn as the home side for Saturday’s final. Afterwards, the manager explained to the official Chelsea website the importance of the visit as part of the match preparations. ‘It’s good for us all to come and get things out of our system before the day of the game,’ she said. ‘The players get to have a walk around, feel the magnitude of the stadium and have a look at our dressing room. Meanwhile, vice-captain Gilly Flaherty has urged her team-mates to use the disappointment of back-to-back defeats in the WSL 1 as motivation to lift the first piece of silverware in their history. ‘After the defeat to Man City, we said to ourselves that we needed to put it right quickly and it just so happens that our next game is a cup final at Wembley. It’s been quite a long wait since the semi-final but now it’s starting to sink in a little bit and everyone is getting ready for the occasion. Supporters can still purchase tickets for the game through the FA, either online or by calling 0844 826 2010. The game kicks off at Wembley on Saturday 1 August at 3pm. 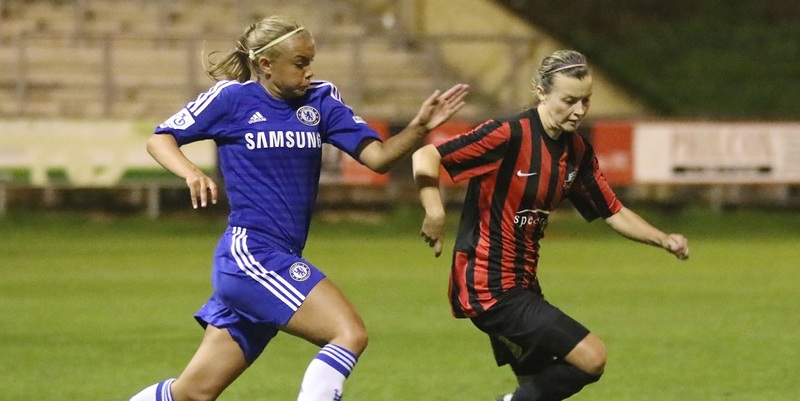 You can follow updates and behind-the-scenes build-up on our official Ladies Twitter @ChelseaLFC.